Guild member, Albert Morch, died in his sleep on Christmas morning in the Tahoe area of California. 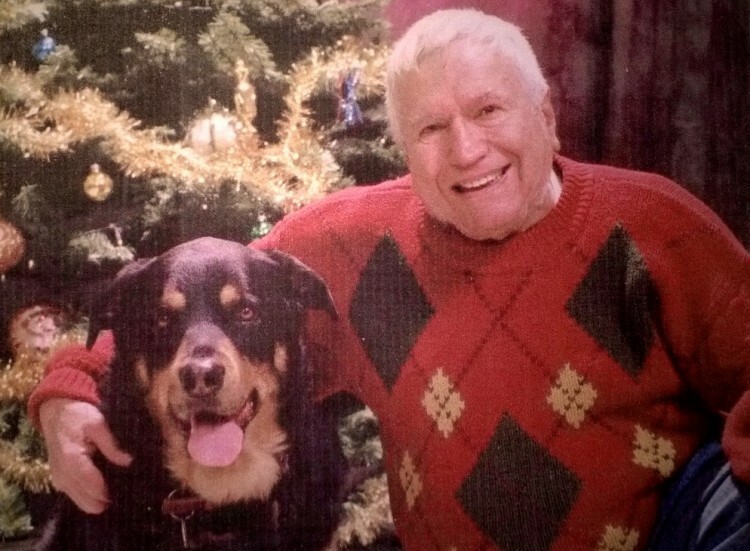 Albert Morch and his beloved rottweiler, Zee Zee in 2002. Photo courtesy Melissa Morch. Morch joined the San Francisco Examiner, then a Hearst publication, in 1967 as society writer. He wrote his influential and entertaining column for 26 years. It grew in popularity and eventually ranked second to that of The San Francisco Chronicle’s venerable Herb Caen. The two developed a friendly rivalry and often chided one another in their respective columns. Morch, originally from Brooklyn, New York, started his career as a writer/photographer for the Hollywood Citizen-News, later joining Fairchild Publications’ Los Angeles Bureau as a general assignment reporter for Women’s Wear Daily. He eventually moved to San Francisco as assistant bureau chief of Fairchild’s San Francisco office, a post he held at the time he joined The Examiner. In addition to writing his society column, Morch also served as the paper’s art critic until 1978. He edited the paper’s east bay edition during the final four years of his career with The Examiner until his retirement in 1996. When he retired, Morch purchased a cabin in Meyers, Lake Tahoe, his home for the balance of his life. At one point in his long career as society columnist, Morch wrote several columns on the growing use of cocaine among the city’s upper crust. Although he named no names, he received credible death threats and was under police protection for several months. In his years in southern California, Morch also worked as a freelance photographer and his pictures of Hollywood celebs appeared in many magazines and newspapers in the US and foreign countries. He is survived by his two daughters Melissa and Stephanie, his one grandson, Talon, and two granddaughters, Kaylee and Mara, as well as his former wife and mother of his children, Lucille, and Jackie, his Jack Russell Terrier. Morch, a navy non-com whose final tour was on an aircraft carrier, requested cremation and his ashes scattered at sea from a ship leaving from Pier 39 in San Francisco. Friends are invited to contact his daughter, Melissa, by calling (818) 640-4790, if they are interested in attending his sea burial. I was saddened to learn of Al Morch’s passing. Being a newspaper reporter was his life. He put his heart and soul into every assignment, even the minor ones, and if you met him, you could set a stopwatch on him. Within 30 seconds he’d announce proudly that “I work for the San Francisco Examiner” and then tell you all about a story he was working on. Whether you wanted to hear it or not. Al’s life touched mine only briefly, but I’ll always remember him with a smile.